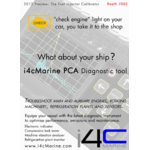 i4cMarine designs and manufactures condition, combustion and performance diagnostic and monitoring equipment for internal combustion engines as well as refrigeration plants, compressors, rotating machinery, sensor and fuel injection components testing and calibration, in portable rugged instruments, designed by engineers for the on site engineer and troubleshooting specialist. Unique methods for condition monitoring, logging operational parameters, proprietary algorithms for visualization of combustion PvsA and Volume for diesel engines, performance of refrigeration plants and rotating machinery. Cutting-edge injector calibrator for quick and reliable adjustment, condition visualization, report printout, increasing productivity and reliability exponentially. The Performance and Condition Analyser and Fuel Injector Calibrator, will be available for a hands on test, familiarisation and evaluation of their unique functions and capabilities. Performance monitoring and diagnostic instruments. The Performance and Condition Analyser and Fuel Injector Calibrator, will be available for a hands on test, familiarisation and evaluation of their unique functions and capabilities. Their developers will present them and provide further insight for their use and how they provide an extra eye for condition of machinery for the onsite engineer and troubleshooting specialist.